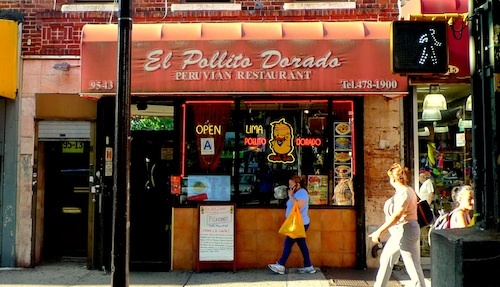 From the outside, this small Roosevelt Avenue Peruvian establishment appears like many others in the city to offer rotisserie chicken as their main item. I was in the mood for some other food though and was pleasantly surprised by the menu that tries to cover many bases. In addition, they offer the three big brews of Perú: Cristal, Pilsen, and Cusqueña, of which I would recommend Cristal ($4.25, below) the highest. And with the cumbia peruana playing on the flat screens, it is all the more reason to have a party. Once I put in an order that included anticuchos, my table was immediately rewarded with the simple yellow aji that they offer to dabble on it. While no food had yet arrived, I dipped a finger in to test it and was rewarded with a burnt tongue. Wait for food to put this on, it's quite hot. Technically an appetizer, the anticuchos con papa a la huancaina ($12.95, below), is a fantastic introduction to two things you will eat a lot of in Perú. I ate one of these two things everyday I was in the country, even if you would not typically see them together. Anticuchos are beef (usually veal) hearts that you can find on skewers on street corners of every city. The version on this dish is taken off the skewer and comes very juicy, mixing well with the sauce from the potatoes, which have been perfectly boiled soft. This yellow sauce is made from yellow pepper. cheese, and evaporated milk, creamy and sweet to combine nicely with the vinegary marinade of the beef. Typically you would eat the dish cold as a starter, but they heat it up here when combined with the anticuchos. 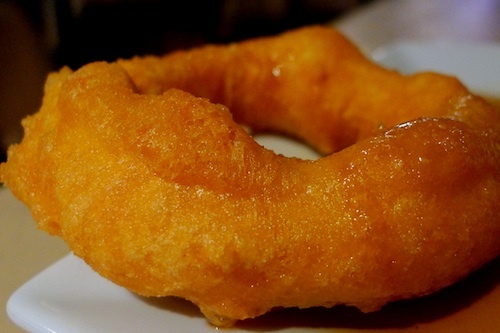 At stalls in a night market or on the street, you would many times see vendors offering anticuchos with picarones ($5.95, below), a fried doughnut. These are special for the perfection of a super crispy outside layer and amazingly doughy soft interior. A sweet syrup is run over them all, and they offer you moist towelettes to remedy this just like they would in Lima. The walls of the restaurant are lined with autographed copies of musician portraits, testimony to the many artists that have played the small stage here. They advertise on the walls for upcoming performances, both in house and within the Peruvian community, making me think this is an important hub of Peruvian identity in Jackson Heights and Corona.